Natasha is beginning her last day in the United States. Her parents are illegal immigrants from Jamaica and they are being deported this evening. Natasha has one last chance to appeal her fate and stay in the home she loves. So when she randomly runs into Daniel, she knows that falling in love with him is not something she has time for. Even if she wasn't facing this deadline, Natasha believes in science and what can be proven, not love. Daniel, however, is sure that the universe has made everything work in order for them to meet and fall in love, despite any protests his family might have. I was somewhat skeptical about this book after hearing the premise but I'm happy to report that I liked it much more than expected. Okay, yes, it is a love story but Yoon handles it surely and makes it seem totally plausible that these two could deeply affect each other's lives even in just one day. It is never too mushy and really focuses on their lives, personalities, and families more than their feelings of being swept away by each other. A romance for people who don't much like romances. So the relationship story is good but perhaps my favorite part of the book is actually the other chapters that are dropped in with explanations of random things or quick stories about secondary characters. 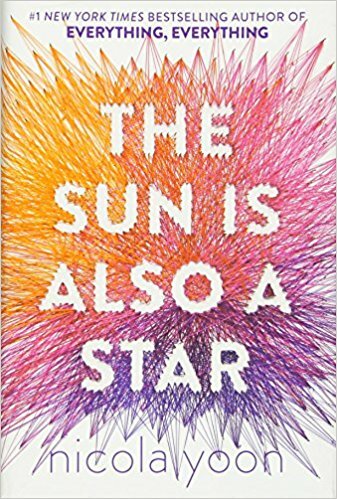 Those are the parts of the story that really made me smile about the book as a whole which felt like magical realism when it was all said and done, even though it was totally realistic.